Terrible Typhoid Mary by Susan Campbell Bartoletti. Grades 5 and up. HMH Books for Young Readers, August 2015. 230 pages. Reviewed from ARC provided by publisher. What would you do if strangers showed up at your door, accused you of sickening dozens of people, and demanded blood and stool samples from you? They claim that even though you haven't been sick, you've infected people you care about with a deadly disease. They tell you that you're a menace to society, that you must comply with them or else. You've never been sick a day in your life. You're a clean person. You know you haven't made anyone sick. The theories they're telling you about sound like gibberish to you. You haven't committed a crime, but they arrest you. This is what happened to Mary Mallon; you may know her as "Typhoid Mary". She was a healthy woman, an Irish immigrant, and a good cook who worked for many good families in New York. She was also a carrier of the deadly typhoid disease. Even though she was not sick (and did not remember ever being sick), she carried the bacteria that cause the disease, infecting people through the food she was serving them. It wasn't her fault. But she was still kidnapped and held prisoner by people who said it was for the public's good. How could this happen? Read Terrible Typhoid Mary to find out. This book is excellent. It's a finely crafted work, presenting a balanced view of Mary Mallon's life and the health workers who locked her up for the common good. The prose reads like fiction and Bartoletti draws out the tension slowly as the reader learns who Mary Mallon was and how she became a suspect in dozens of typhoid fever cases. Historical details paint a picture of life in the early 1900s, revealing the action as if the reader is watching it unfold. Bartoletti is careful to present Mary as a sympathetic character. She brings in statistics and facts from the present day to put this historical event in perspective. For example, she explains Mary's reluctance to believe the scientists by pointing out that 51% of Americans "say they trust scientists and the scientific information a little bit. Six percent don't trust scientists and their facts at all." [page 56] Knowing that even today not everyone trusts scientific information, it's easy to see why Mary might not have been convinced in 1907. Earlier this year, I read and loved Fatal Fever by Gail Jarrow, another book about the typhoid fever epidemic and Mary Mallon. 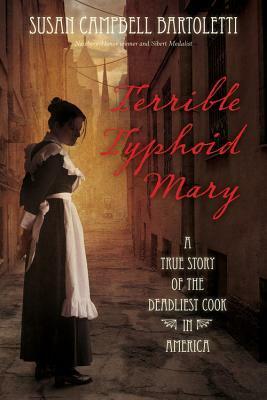 While that book concentrated more on the epidemic and the disease, Terrible Typhoid Mary concentrates more on Mary as a person. I am happy to say that there is room for both books on library shelves, and both are excellent reads. For those looking for another great read about typhoid fever, don't miss Fatal Fever by Gail Jarrow (and also check out the readalikes I listed in that post!). If you're drawn to Susan Campbell Bartoletti's well-crafted writing depicting historical events as a gripping drama, check out The Family Romanov by Candace Fleming.